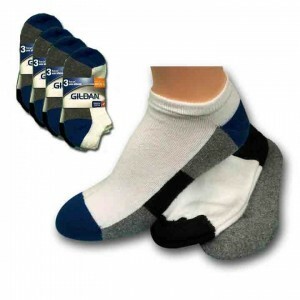 Home / Children's Socks / Gildans Boys No Show Assorted Socks, per doz. Gildans Boys No Show Assorted Socks. A rugged sock with a whole lot of style. Category: Children's Socks. Tags: casual socks, exceptional comfort, Exceptional looks, Low cut socks, Multiple Colors, Ring Spun Dand. Terry-Half Cushion, sport socks, tennis socks. Color: White with multi-color toe, soles and heel.